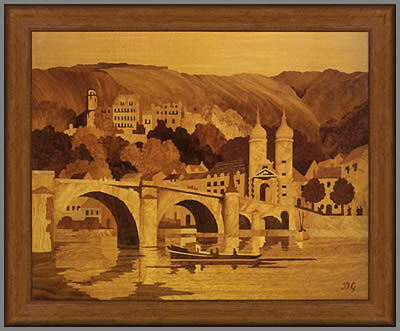 April's update brings you a very pleasant collection of Buchschmid and Gretaux wood inlay pictures. One in particular (Quartet) is one of those rare examples we have not previously encountered. 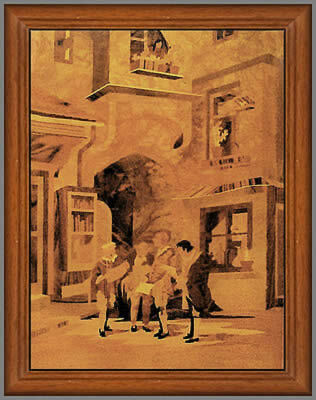 We are always pleased to find a "new" B & G piece, and this is a fine example we think you will enjoy as much as we do. Our April update brings you some very clean looking Buchschmid and Gretaux wood inlay pictures from the collection of Chris Sadler. 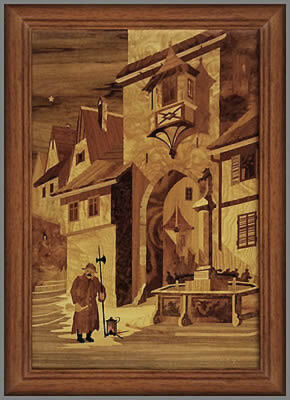 The top picture which is titled Dinkelsbuehl Village also features the Night Watchman. We have seen other versions of this particular picture before, and amazingly some did indeed go by the title of Night Watchman. Buchschmid and Gretaux did sometimes vary the titles of their works, so if your official Buchschmid and Gretaux label is missing from the rear of your picture yuo may have two options for the title choice of your own picture - confusing isn't it! The next picture does indeed have two titles and both are quite legitimate. 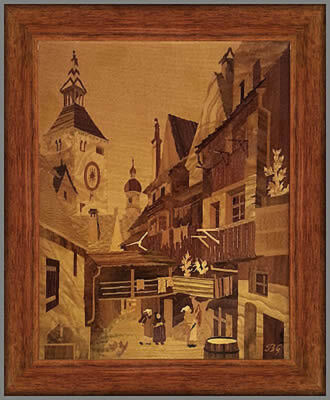 This one is Landsberg or The Witches Quarters - both titles are applicable. One thing you may particularly notice is the clarity of these pictures, this comes about from Chris correctly taking the photos at an angle to the picture, probably about 60 degrees. The importance of taking photos of Buchschmid and Gretaux pieces at such an angle is because of the reflective quality Buchschmid and Gretaux achieved with their high gloss varnish. That high gloss varnish unfortunately acts somewhat like a mirror and it reflects everything in front of it. If you take a photo of a Buchschmid and Gretaux piece directly in front of the piece with the flash operational on your camera, the 'flash bounce back' from the varnish on the piece will more or less bleach out a major portion of the photo. This is mostly near enough impossible to correct satisfactorily and therefore requires us to make compromises with the photos in order to make them useable. However, if a photo is taken at an angle to the piece, then we can avoid the problem of flash bounce back - and the clarity and integrity of the photo will remain intact. The geometrical distortion is not a problem, that is very easy for us to correct, it is that reflective problem which causes us a few headaches in trying to remedy such faults. So, if you could manage to follow Chris's example when taking photos of Buchschmid and Gretaux pieces it will greatly enhance the reproduction of your Buchschmid and Gretaux piece when we feature it in these pages. Anyway, getting back to these pictures themselves, the next one down in the line is the famous Buchschmid and Gretaux view of Heidelberg from across the Neckar River. The last picture in this month's Buchschmid and Gretaux collection is one we have never seen before. This one is owned by Linda Davis and from checking our B & G lists, we think it could well be "Quartet". Not one of their regular pieces, but a very interesting picture nonetheless. 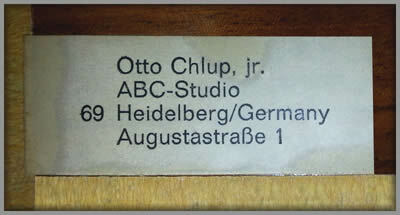 And finally we have the Otto Chlup label from the rear of one of the above B & G pieces. A good sign of authenticity which goes hand in hand with the BG logo on the picture itself. Click the above button to return to page 53 of "Can You Help"